Headache is one of the most common forms of pain and almost all of us have experienced headaches at some point in our lives. The problem arises when these headaches become more recurrent and severe which calls for special attention and treatment. Migraine is a particular type of headache in which the pain is accompanied by other symptoms such as nausea, vomiting and sensitivity to light. Other than migraines, headaches can be caused due to a number of reasons such as hormonal headaches, sleep deficiency headaches, tension headaches and medication headaches. Most of us reach out for an over-the-counter pain killer in order to get quick relief from a headache. But, these medications cannot provide long-term relief from the problem or cure it from the root. This is where the role of acupressure comes into play. Acupressure is an ancient therapeutic treatment method which helps to balance the flow of energies in the body by stimulating specific acupressure points in the body, which in turn helps to cure various types of pains, diseases and conditions including headache, migraine, arthritis pain, digestive disorders, asthma, hypertension, insomnia, sexual dysfunction, etc. 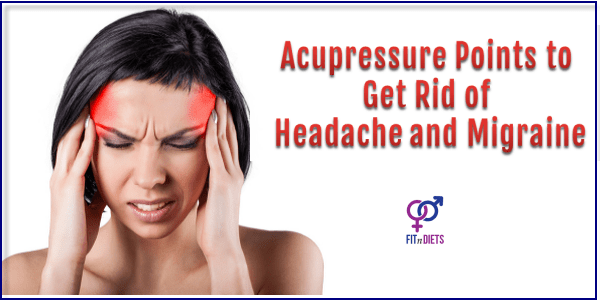 How Acupressure Relieves Headaches and Migraine? In Traditional Chinese Medicine, acupressure is considered a holistic approach that uses various pressure points in the body to balance the flow of energy. In acupressure, the body is divided in to 12 basic meridians. These meridians represent pathways for life energy. It is believed that any type of illness including headaches and migraines are caused as a result of blockage in the flow of energy. Application of pressure at specific pressure points can unblock these energy pathways and restore the flow of energy, which helps to relieve headache and other pains and disorders. The Union Valley or He Gu is one of the most popular acupressure points that are stimulated for treating various conditions and pains. This point is situated in the soft fleshy web between the thumb and index finger. 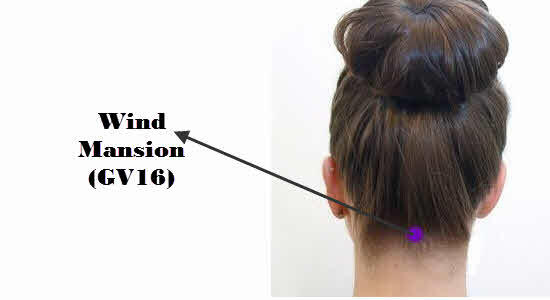 This point can be stimulated in both hands to relieve headache and migraine. You can use the fingers of your left hand you apply pressure to the LI4 point in your right hand and vice versa. Apply deep and firm pressure on the point for at least 1 minute. The LI4 acupressure point can also be used to treat digestive disorders, diarrhea, abdominal pain, painful periods, irritability, etc. 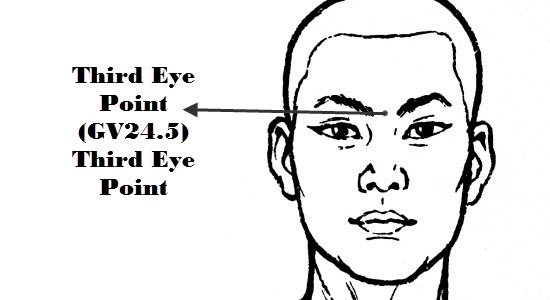 This is one of the most important acupressure points for headache that is located in the face directly between the two eyebrows, at a point where the bridge of the nose joins the forehead. This point can be stimulated by applying firm but gentle pressure for at least 1 minute. You can apply pressure in a soft circular motion with your index finger or thumb. This point also helps to balance the pituitary gland, relieve eye pain, eye fatigue and strain, hay fever, indigestion, ulcer pain, etc. The Drilling Bamboo or Bright Light Point is a pair of facial acupressure points located in the front of the head, at the inner corner of both eye, precisely above the eyelids and on the bone surrounding the eyes. This pair of points can be stimulated together by using both your index finger and thumb. Apply firm and controlled pressure for at least one minute. You can also stimulate the points separately, but make sure you press each point for 1 minute. 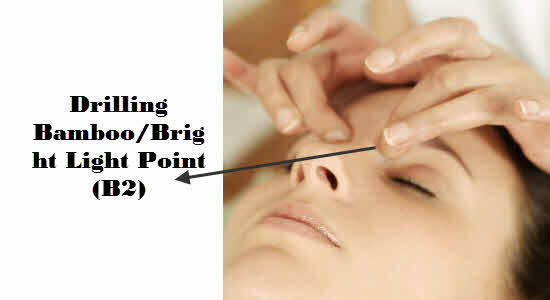 This point also helps to improve vision, relieve eye fatigue, sinus pain, eye pain and hay fever. The Welcome Fragrance is one of the beneficial acupressure and acupuncture points for headache that is often stimulated to relieve migraine headaches. 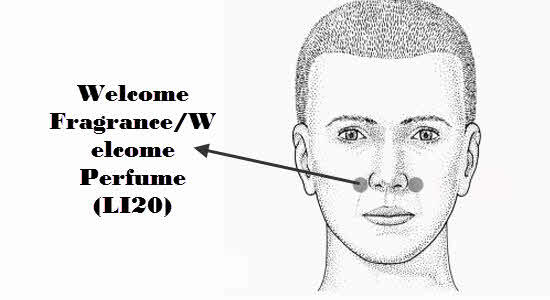 This is a pair of points which is situated at the outer side of each nostril, at the bottom of the cheekbone. These points can be stimulated by applying deep and firm pressure in a circular motion for 1 minute. Proper stimulation of these points helps to unblock the sinuses, relieves toothache and eye fatigue, and cures headaches caused of migraine and tension. This is one of the common points of acupressure for migraine headaches. 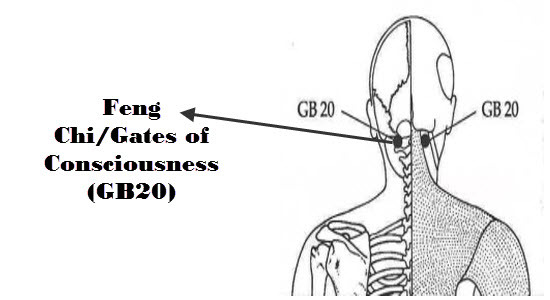 Feng Chi represents a pair of pressure points that are located at the back of the head just below the ears. You can find the exact position of these two points by locating the two hollows on the back of the neck at the base of the skull. You can stimulate these pair of points by cupping your skull with your hands and placing your thumbs in the hollows at the base of the neck. Apply firm and deep pressure at the points for 4 to 5 seconds and continue it up to 3 minutes. Relax and breathe deeply while massaging this acupressure point. Stimulating this point also helps to relieve stiffness of neck, dizziness, neck pain, eye strain, irritability and arthritis. It also helps to correct neuromotor coordination problems. This is one of the functional pressure points to relieve migraine, stiffness of beck and mental stress. This point is located exactly at the center of the back of the head, midway between the ears and spine. You can locate it by finding the hollow at the base of the skull. Stimulate this point by applying deep and firm pressure into the middle of the hollow for at least 1 minute. This acupressure point is also beneficial for relieving eye pain, earache, nose pain and throat pain. It also helps to cure vertigo and mental problems. This is one of the most useful pressure points for headache relief that is located at the neck, right at the base of the skull, on the ropy muscle one-half inch towards the outside of the spine. You can stimulate this point by applying firm pressure in circular motion for 1 minute. Stimulating this pressure point also helps to relieve stress, exhaustion and insomnia and promotes restful sleep. It also cures eye strain, sore throat, stiffness of neck and heaviness of head. This is one of the less-known acupuncture points for migraines and headaches but it is exceptionally effective. 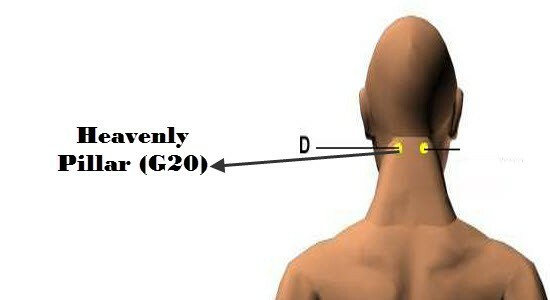 This point is located on the top of the shoulders, two fingers width out from the base of the neck. You can use your index and middle fingers to apply firm and consistent pressure on this point for 1 minute. 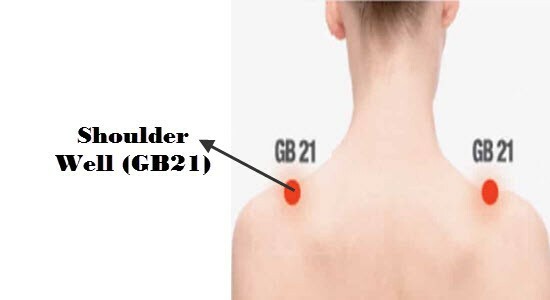 Stimulating this point on both the shoulders helps to relieve aches at the back of the head, neck pains, stress, stiff neck, and insomnia and eye strain. This is one of the crucial points of acupressure for headache that is located on both the feet. This point is located on the feet, between the big toe and the second toe, in between the bones. You can stimulate this point by applying steady pressure in circular motion for 1 minute. You can use your thumb or index finger to apply pressure on these points. Applying pressure to this point helps to relieve headaches, eye fatigue, foot crams, allergies, arthritis pain and heaviness of head caused by hangovers. This is one of the most effective acupressure points fo pain relief that is located at the top of the foot, an inch above the webbing of the fourth and fifth toes. You can use your index finger to apply firm pressure to this point for 1 minute. Activating this point helps to relieve pain caused by sciatica, headaches and arthritis. It also helps to cure water retention, shoulder tension and hip pain. It is important to apply the correct amount of pressure – In order to get the maximum benefits from acupressure, it is important to apply the right amount of pressure on the pressure points. Always use firm and deep pressure on the points when you are stimulating them. The points should feel sore under the pressure, but the pain shouldn’t be unbearable. Some points may feel tense when stimulated. If you apply excessive pressure on any point and feel increasing pain then gradually decrease the pressure till you attain a balance between pain and pleasure. You should not endure uncomfortable pain during acupressure therapy. If at any point, a pressure feel uncomfortable or unbearable then stop applying pressure at once. Choose proper pressing aid – Because acupressure involves stimulating of pressure points, make sure you use the right equipments for stimulating the points. The most common tool for stimulating the pressure points is your fingers. You can also use your knuckles, elbows, knees, legs and feet to stimulate certain pressure points. You can also use golf balls or tennis balls to apply pressure on certain points. So, the next time you have a headache, try stimulating these above mentioned acupressure points instead of reaching out for pain killers and cure the problem of headache and migraine from within with the power of acupressure.